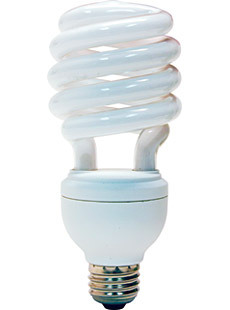 Information about Saving money with Compact Fluorescent Lights. Okay, if you only do one single "green" (whether that's eco-green or money'green) thing, do this: replace at least one, and preferably all, of your old incandescent light bulbs with modern compact fluorescent light bulbs, also known as CFLs. Compact fluorescents can save you some REAL money by saving a lot of energy, and they'll also help reduce the amount of nasty pollution that fossile fuel power plants belch into the air. Whether you're into the environmental thing or not, getting CFLs for your home or business is a NO BRAINER! Okay, folks, I want to tell you about a complete no-brainer that - if you haven't already - you need to pick up TODAY to do your part to save civilization and save yourself some bucks: replace your incandescent light bulbs with compact fluorescent light bulbs. Compact fluorescent lights, also known as "CFLs", are highly compact versions of the big fluorescent lights you normally see in kitchens, garages, and other areas that need a lot of area lighting. But CFL bulbs are the same size as regular light bulbs: they're the bulbs that look like little white pig-tails glued onto a light bulb base.There are other kinds, too: floods, ones with different shaped glass fixtures, and even ones that look a lot like incandescent bulbs. But one thing is the same for all of them: they will SAVE YOU MONEY! Here's how: Compact fluorescent light bulbs use only about a quarter of the power needed by old incandescent bulbs to produce the same amount of light. So, let's say the incandescent bulbs you use now in your light fixtures are 60 watts each. If you get CFLs that produce the same amount of light, they'll only use about 15 watts each! I figured we were spending about $438 per year for electricity to run the incandescent bulbs, but are now only paying - get this! - about $109 per year using the CFLs. And that doesn't include the money we'll save replacing the incandescents all the time. That's a difference of over $329 that we'll save each year! I don't know about you guys, but that's a car payment for me. So what does that mean money-wise, you ask? Well, let's figure this out: if you used a 60 watt bulb five hours a day every day for a year, and the cost of electricity was $0.10 per kilowatt hour, you'd pay $10.95 for electricity to run that one light bulb for the year. But for a compact fluorescent bulb, the cost of electricity would only be $2.75. It's a no-brainer! But wait, it gets better: CFLs last a LOT longer than regular incandescent bulbs. Your mileage will vary, but they'll normally last about 15 times longer than incandescents! So you'd have to buy 15 incandescent bulbs to last as long as a single CFL. At around $0.50 per incandescent bulb, that's an extra $7 or so that you'll spend on replacements, and THAT would be enough to buy three or four more compact fluorescent bulbs (which you can get now for around $2 each)! So, the bottom line is that you can SAVE over $8 per year per bulb in electricity costs, plus an extra $7 or so that you'd have to pay to replace incandescent bulbs over the lifetime of a single compact fluorescent bulb. Maybe you're thinking those savings are a big "So what?" Well, I did a little figuring for our house. We've got a total of 48 bulbs that I replaced with CFLs. I estimated how often each of those bulbs was used during the day, then figured how much power they used - incandescent bulbs vs. compact fluorescent bulbs. The result? I figured we were spending about $438 per year for electricity to run the incandescent bulbs, but are now only paying - get this! - about $109 per year using the CFLs. And that doesn't include the money we'll save replacing the incandescents all the time. That's a difference of over $329 that we'll save each year! I don't know about you guys, but that's a car payment for me. Last but not least, CFLs don't get hot, so you won't burn your hands the next time you mess around with that light fixture! While CFLs are an awesome energy saver, please take heed: they do contain a small amount of mercury (which is contained safely inside the bulb), and they need to be properly recycled! Please DON'T just throw CFLs into the trash! Take a couple minutes to find out where you can get them recycled or disposed of safely. So, you just saved a bunch of money. But that's really just the icing on the cake. Behind the scenes, while you're enjoying your extra spending money, every compact fluorescent bulb you use saves about 1,000 pounds of carbon dioxide and other nasty stuff being spewed out into the air from power plants over the life of the bulb. If everyone in America replaced just ONE of their old incandescents with a compact fluorescent bulb, the reduction in pollution would be like taking one million cars off the road. Talk about incredible power in a small package! So, even if you're an unbelieving eco-potato, at least save yourself some real money by replacing all those incandescent light bulbs with energy- (and money-) saving compact fluorescent bulbs!